There’s no question that paddle boarding is a great way to get a little sunshine, exercise, and relaxation. That’s why you hit the water as often as humanly possible. However, have you ever considered competing in a professional race? In this post, we’re going to explain to you why you should compete and how to get yourself ready to do so. Whatever your reasons for starting with this sport, competing is a logical progression. Training for a race is more demanding than paddling for fun, so you’ll have to work harder. It doesn’t matter where you finish in the race so much, but competing will motivate you to train harder. It’s like people who sign up for a marathon to motivate themselves to get fitter. Except here, you don’t have to worry about hitting the pavement; you get to enjoy the water instead. Surprisingly, you might already have the right gear. Here are the essentials. It’s not a deal-breaker if your board is not inflatable, but it does make things a lot easier. You do need a board designed for racing, though. That means choosing a displacement hull over a planing hull. • A displacement hull: Designed to maximize speed. They are aerodynamically built to glide through the water more smoothly. The board offers less resistance than a planing hull. It’s a slightly more advanced board because it is not as stable in the water. • A planing hull: This is the typical board that most people start with when beginning to learn SUP. This is a wider, flatter board that is quite stable. Speed-wise, a planing hull is okay but is no match for a displacement hull. It essential to get yourself a good racing paddle. If you’re competing seriously, this is the fastest way to improve your performance. Plan to spend a little more and get a better brand paddle. A smaller blade that is lightweight allows you to achieve better speed. That said, do consider where you’ll be using the paddle. If you’re going to be using it in a river, there’s a danger of it getting bashed against rocks. For this reason, a fiberglass paddle is a better option because it’s more durable. If you’re in the sea, however, you want something that is lighter and more efficient. In this instance, a carbon blade is the better bet. 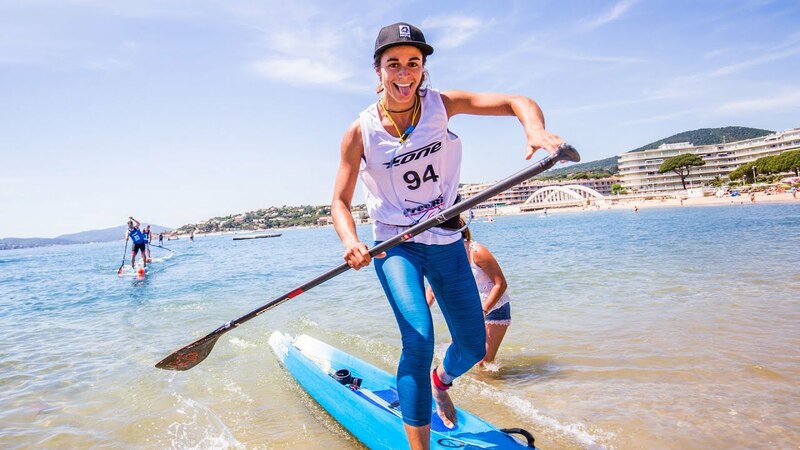 Whether you’re thinking about competing or not, we’d advise you to invest in a good brand when it comes to paddles. Entry-level options tend to be heavier and poorly constructed. Your shoulders and muscles will thank you for upgrading. Most race organizers require leashes and life jackets or PFD. These help to keep you safe and hold onto your board if you end up in the water. You’ll need to start with getting enough water. A life straw could be a good option if you don’t want to weigh yourself down with supplies. This device filters debris out of the water you’re paddling on so you can drink it. A water bottle is an alternative. A handy, hands-free method is a hydration pack. This is attached to your vest or part of a vest and makes it simple to carry enough water. Aside from the water, you’ll want to think about sunglasses. Get a neoprene band to make sure your shades stay put. Speaking of the sun, sunblock and a lip balm are also good additions to your kit. It can be useful to have a smartwatch that can help you track distance, heart rate, and so on. It’s not essential, but it can come in handy. Finally, if you’re training on your own, let someone know where you’re going and when you expect to be back. If something goes wrong, that person can call in for help. As the popularity of the sport increases, there is also an increasing number of events that you can sign up to join. 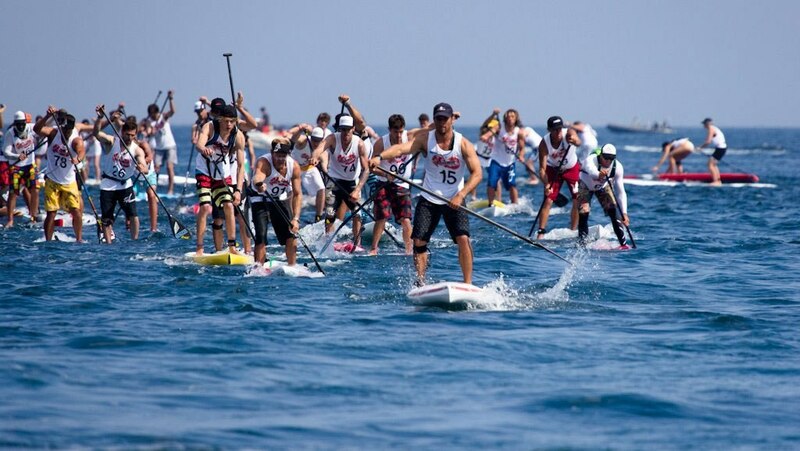 We’d advise heading over to the SUP store and asking them for updates about upcoming races or race organizations that they think you should check out. Look for a race that matches your ability level. A fun race is a great way to start off to get a feel for things. That way, you’re competing with other beginners, so you have a good experience. Alternatively, why not get some buddies together and arrange your own race? Get them to invite others, and it will soon blossom into a fun competition. Paddle boarding is paddle boarding, right? Not really, the water you’re racing on makes a difference. • Inland Lake Races: The conditions in a lake tend to be more predictable and calmer. The weather and water conditions are not likely to change drastically, and there are no strong currents to contend with. This is a good choice for a beginner. • River Races: These present their own unique set of challenges. The water conditions are changeable, and there is a risk of hitting submerged objects. There could also be areas where the current is strong or where there are rapids. • Ocean Races: These tend to be easier than river races in one respect — you’re not likely to encounter submerged obstacles. That doesn’t mean that everything is easy, however. The water conditions can change quickly, and you have waves and currents to fight against. If you’re experienced, the idea of taking a couple of lessons may seem laughable, but hear us out. Over time, you can learn bad habits. A pro can come out, check your form, and offer suggestions for improvements. If you want to compete, these refresher lessons could be your most valuable investment. That’s going to depend on how seriously you want to take things. If you just want to enter a race for fun, a coach may be overkill. If you have goals that you want to achieve, a coach could be a good idea. They’ll help you formulate a plan, give tips on your form, and teach you how to prepare. All that’s left now is to train yourself and get ready. This is easy — get out there and train as much as possible. Choose a variety of water and weather conditions so that you’re prepared for anything. Supplement your training with CrossFit and strength training, so you’re in peak physical condition. Then go out and have fun. Good luck!